It may have been noticed that I’ve yet to feature a Friday cocktail with rum as its main ingredient. The reason is simple. I’m not a fan. Yes, the drinks are often colorful and very tasty with frequently tropical flavors. The rum quite well disguised that one could drink several before it creeps up on you unexpected. Personally, I’ve learned two things about rum. 1) Never mix it with melted butter or lots of oil. 2) Beware of switching between rum drinks and those with gin, vodka, or whiskey. 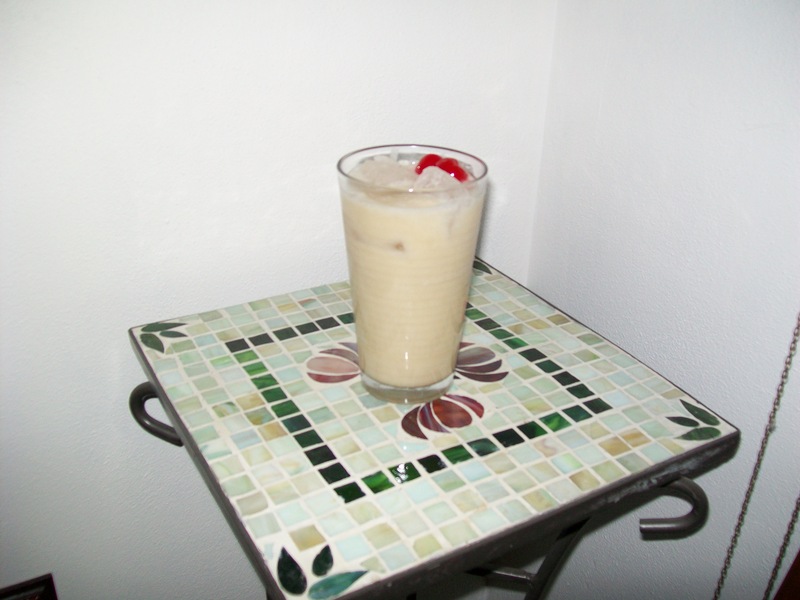 However, it is time to feature my favorite rum based drink, the Piña Colada. It’s a perfect, refreshing summer drink and a great way to celebrate what I consider the last gasp of summer, the Friday before Labor Day. The Piña Colada appears to have been re-introduced at Caribe Hilton’s Beachcomber Bar in San Juan, Puerto Rico, in 1954. References to a drink with these ingredienst date back to the early 1800s in connection with a Puerto Rican pirate Roberto Cofresi, but apparently this original recipe was lost. What you’ll need: White Rum (although dark rum can be used in a pinch), Pineapple Juice, and Cream of Coconut. Ideally, put 2 cups of crushed ice in a blender with 2 ounces of rum, 2 1/2 ounces pineapple juice, and a whole lot of cream of coconut (well, about 4 or 5 ounces.) Pour into a hurricane glass–or any fancy glass of your choice–and garnish with a fresh slice of pineapple and a maraschino cherry or two. The drink pictured was actually created by pouring the ingredients in a shaker over cracked ice and then straining into the glass over cubed ice. If you choose this method, make certain to have a strong, firm grip on the shaker and its component parts! How I like it: With as fresh ingredients as possible. Cream of coconut is a must. Some recipes suggest coconut milk mixed with condensed milk may be used as a substitute, but it’s not the same. And–especially with rum–always drink responsibly.